Perfect for all wine enthusiasts, with this effective corkscrew wine opener, you can open your bottle of wine quickly and easily. The lever or "rabbit" corkscrew is operated using a pair of handles which are used to grip the neck of the bottle, and a lever which is simply pressed down to twist the screw into the cork, then lifted to extract the cork. Expelling the cork from the device is done with a similar press/lift action. A Well-designed and vintage style great gift for any event, such as Christmas, wedding, housewarming, garden party or birthday, with unique luxury bronze / copper plated finish. Corkscrew APPLIED TO - natural and synthetic corks, any size bottle of wine or champagne, an essential for wine lovers, makes opening your wine as easy as enjoying it! 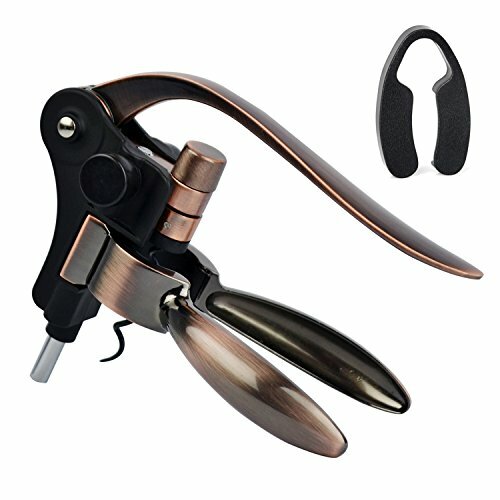 EASY TO USE - Takes just five short steps, easily pull the cork out of the bottle with minimum effort in less than several seconds.Designed base on classic lever and grip, this Wine Opener is work on the idea of mechanical advantage. DURABLE Wine accessories- The main material is high quality Zinc alloy, the plastics part is made with food-grade PC and silicone, which make it very durable. BEST GIFT EVER - It's the best and the most universal gift for any occasions: birthdays, weddings, anniversaries, housewarmings, Christmas, thanksgiving. If you have any questions about this product by Hotder, contact us by completing and submitting the form below. If you are looking for a specif part number, please include it with your message.